Bairns heading for the top! On the back of a 13 game win streak which has seen them claim top spot in the Clydesdale Bank Premier League, Celtic are a side in devastatingly astute form. Contrastingly, the First Division campaign has been an inconsistent one for Falkirk with too many defeats in their chase to pip nearest rivals Ross County to promotion. Both sides however, have had similarly clinical performances in the League Cup resulting in the surprisingly thrilling semi-final at Hampden on the 29th of January. It was Falkirk’s first appearance in a major semi-final since their historic Scottish Cup run in 2009, where they were eventually beaten by an overpowering Rangers side. They produced a revenge act this season with a 3-2 win against Rangers at the Falkirk Stadium in the 3rd round and since that point have attracted resounding praise for their breath-taking brand of football. Led by former Hearts and Dundee United player Steven Pressley, the Bairns play a stylish attacking type of football which is built upon a strong, organised foundation – much like the style their manager was renowned for as a player. 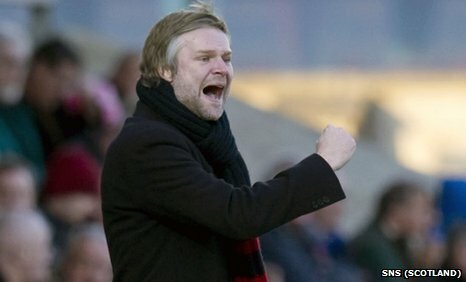 Pressley – who led Falkirk to relegation in his maiden season – has recovered an ailing Falkirk side to a prominent force in Scottish football. Although having never won the Scottish League, Falkirk are one of the oldest sides in Scotland after being founded in 1876. Their recent relative success is testament to their youth structure – first led by former manager Eddie May before being taken to a new level under Craig McPherson – with their first team squad boasting 10 academy graduates. Of those graduates, at least 6 have made over 10 appearances – more than contributing to their season so far. Approaching the Celtic game, there was focus put, quite rightly, on the in-form Celtic side. The media cast up the surprise 2-0 Scottish Cup defeat to Ross County as the last time Celtic met a First Division side in a domestic cup semi-final. Neil Lennon had to make sure that his Bhoys weren’t dealt another surprise blow by the Bairns. Of the Pressley’s Bairns, Farid El-Alagui, Mark Millar and Jay Fulton were the particular focus of attention before the game. El-Alagui has scored 21 goals in all competitions this year, offering Falkirk a talismanic figure in which they build their play around. Former Celtic youth player Mark Millar struggled to make the breakthrough at Parkhead under Gordon Strachan, but his first match against his old club since leaving represented him with a chance to get one over on his former side. As mentioned, Falkirk have invested a lot of faith in their youth players and no better example of that faith paying dividends is 17 year old midfielder Jay Fulton. Brother to Dale – also in the Falkirk squad – and son of former Hearts legend Stevie, Jay began his youth career at Celtic before making the move to Falkirk. The gangly midfielder shows a calm state of mind when faced with pressure for someone so young. At 17, his performance in this semi-final was one which belied his years. Although not dominating the play, Fulton made enough of a contribution through his equalising goal in the first half for Celtic to consider him a threat. He isn’t the only player under 20 who is developing a name for himself, with Murray Wallace, Kieran Duffie, Stephen Kingsley and Craig Sibbald all attracting interest with their fantastic displays. Sibbald especially, may be the most difficult player for Falkirk to hold on to after reported suitors from the Old Firm, Arsenal, Spurs, Man City and Liverpool all showing interest. The 16 year old only made his debut in July, yet has appeared 19 times for Falkirk, including that famous defeat of the Ibrox side..
All the aforementioned players featured at Hampden against Celtic, and to a certain extent did not disappoint. Fulton got the goal which had Celtic worried for a time, until going on to win 3-1. Wallace played well in defence as did Duffie but were given a harsh lesson in top class striking by Gary Hooper and Anthony Stokes, surely a reminder for the youngsters that their short term development rests solely in the hands of their current club. El-Alagui and Miller played well at times, with Miller showing sporadically that he is immensely talented in the middle of the park. From the first whistle it was apparent that the midfielder knew how to retain possession among some of the best central midfielders in the country. Sibbald made a fleeting appearance at the end of the match – he had only recently returned from a potentially terrible knee injury – but it was a significant substitution, with Pressley showing that he is more than confident the young winger can cut it amongst illustrious opposition. The real star on the day for Falkirk though, was an unknown Mancunian wearing the number 10 shirt so famous among Falkirk fans. In a similar role to that occupied by the legendary Russell Latapy, Kallum Higginbotham terrorised Celtic’s defence with a performance full of flamboyancy. At 22 years of age, Higginbotham has enjoyed a mediocre career with Oldham, Accrington and Rochdale until settling at Falkirk. Now under the stewardship of Pressley he has excelled in a role just behind El-Alagui, providing the creative thrust to a side which has plenty of power and passing in abundance as well as being very capable defensively. For Fulton’s goal, Higginbotham demonstrated a magnificent body swerve to lose Celtic’s Victor Wanyama before playing a perfectly weighted pass in to the winger’s path to score the goal. Although Celtic ran out deserved winners, for long spells the First Division side performed a role reversal, dominating their loftier opponents. Now after the disappointment of missing out on a cup final, the Falkirk Bairns must continue performing with a courageous attacking approach which has served them so well thus far. Falkirk are slowly but surely developing an identity based on successful top-class youth players well on their way to taking themselves and their club to the top! Coming next: Who’s better – Part 2. Posted in Uncategorized and tagged 3-1, Celtic, co-operative insurance, cup, duffie, el-alagui, Falkirk, Falkirk stadium, Football, Forrest, Fulton, hampden, higginbotham, Kingsley, league, Lennon, millar, parkhead, Pressley, Scottish, semi-final, sibbald, soccer, Wallace. Bookmark the permalink.